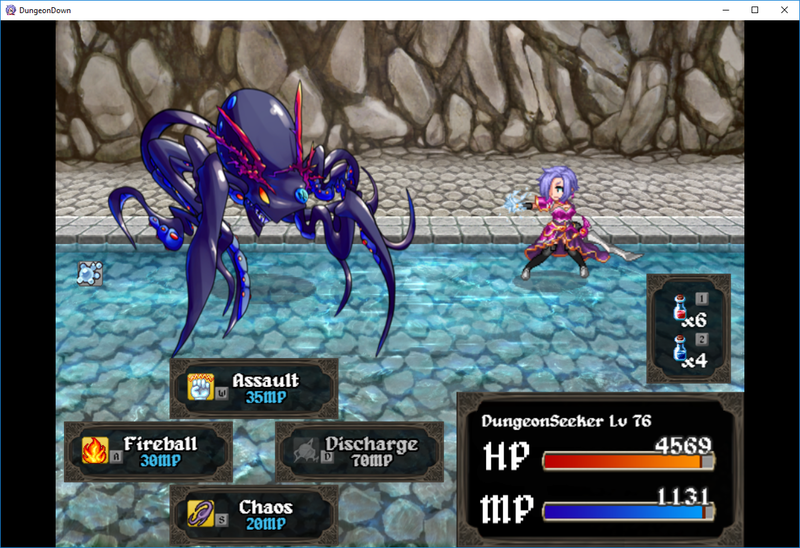 DungeonDown it's a fast paced dungeon crawler jRPG made in Rpg Maker MV for the IGMC 2017. Over 80 floors to explore. Download and unzip folder and run game.exe. This current version has some bugs that can be avoided running the game as Admin, just right click on "Game.exe" and select Run as Administrator. i finished but i want more :O !! 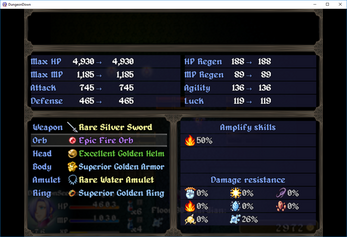 ..
Hey @slemon, you really finished everything in the game. Incredible, you have all the best equipment. Unfortunately the development of the game has stopped for a while because I'm focused in another projects, you know, we have to put food on the table. When things calm down, I'll get back to the game. Thank you very much for playing the game and for your kind feedback. I really like this game, are you planning to expand on it later? 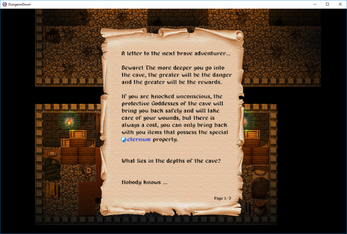 Create dungeons with more rooms, traps, some puzzles and more randomized. That sounds great! I'll be sure to follow the development of the game. I played this for like 4 hrs man. Wow, looks like you had some good time with the game. I really put my heart into this project and I feel fulfilled when someone likes the game so much. Thanks for your feedback Archeia! Did a write-up on this game! Probably the most addictive game I've played so far! Hey @scitydreamer, thank you for your amazing review. I left a message in your blog, keep up the good work! The Short: It's just fun. Excellent combat system. Simple, fast and cathartic. 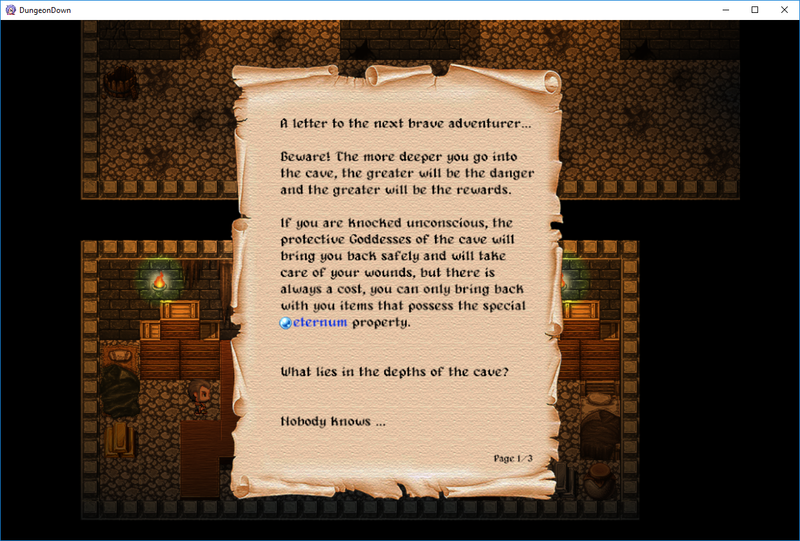 Addicting dungeon exploration and treasure. I wanted to keep playing. No story. There really isn't much going on here, but it doesn't matter because more loot! 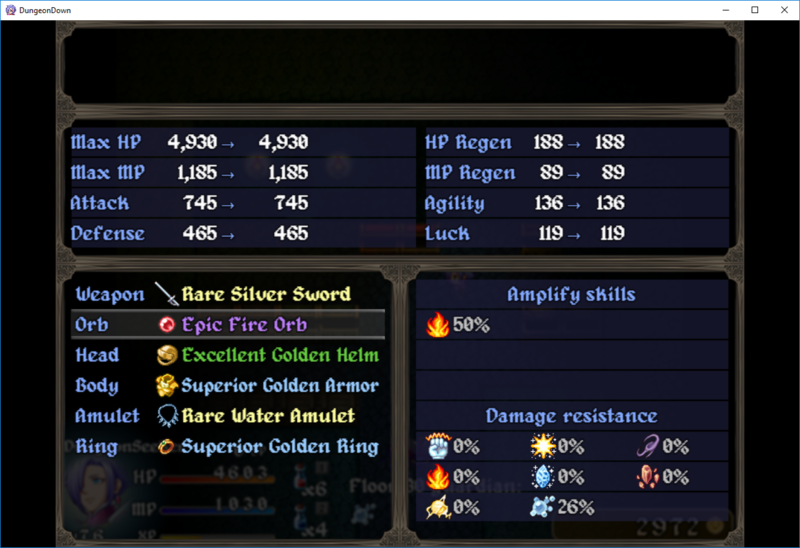 Some of the items/weapons etc. were a bit confusing in what they did, and what the different tiers of power were. There are so many different types of gear it gets a bit overwhelming trying to figure out what to get excited about. 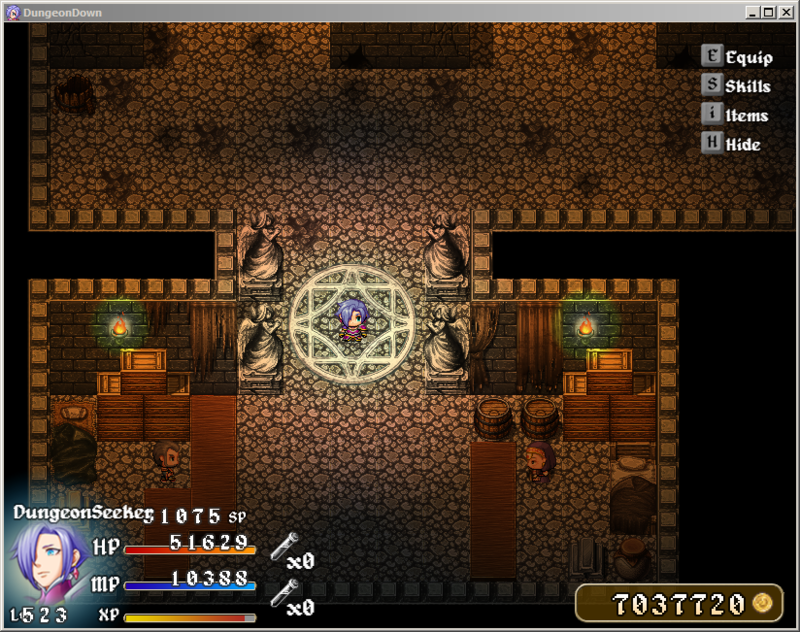 Mapping is functional, but the dungeon levels get a bit repetitive in layout, especially given that there isn't much reason to explore in the first place. If dungeon crawling with some roguelike features are your thing, this game is fantastic. 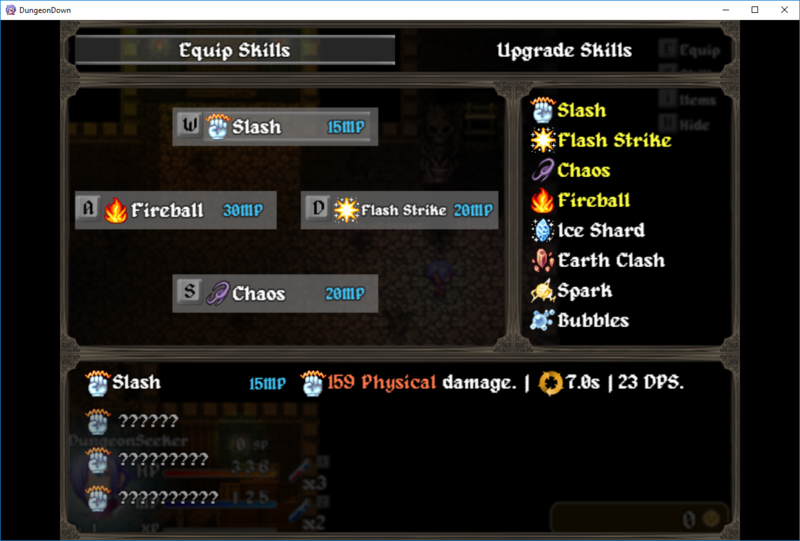 The fun of the combat system and skill progression more than overcome its minor flaws. Thank you so much for your honest review! I'm glad you had fun playing! I can't believe I didn't hear about this one yet, so I'm glad I saw it on drifty's channel. Great game with engaging combat! :D This deserves a vote for sure! Hey DrassRay, thank you so much for your kind words, I really hope you have fun playing the game! Hello @Tofu_Sheets_Visual, thank you for giving it a chance, I hope you enjoy the game! Played this one. Was a nice bit of fun learning the equipment and when to apply the Eturneum to them. I enjoyed going over the levels a bit again and again as the last chest was the best equipment. Found myself to be so high of a level afterwards (320+) that most enemies died in one hit. Found one bug for you. When you play the game and then select to exit to title and start a new game, all your skills are still at the level they were from the last game. 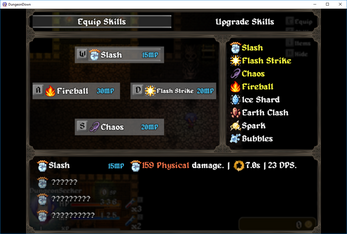 Was funny when I wanted to start over and my character had every spell at max. I couldn't cast any, you don't start out with enough magic. lol. I would maybe suggest that you put in a penalty as well. The death count doesn't seem to do anything. I can go in, play and exit then go back in the same area. (looking for equipment) as many times as I want. The player should only keep the Eturneum equipment if they die, not by exiting. Hey @NewQuestGaming, wow, you definitely played a lot, the maximum level I reached in my tests was 150, I am so glad that you had fun playing. Good suggestion, right now the death count is only for statistics, that would be a way to give it more purpose. I had issues with my original submission upload as well. Can't wait to check out your game. 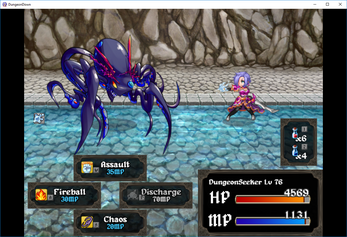 As a D&D and JRPG fan, I think it'll be fun. and thanks ! for more information, push F8"
Hello @wikan, thank you for trying the game. Try to right click on the game.exe and select to Run as Administrator, maybe this fix the issue. Hey @CloudTheWolf. Thanks for giving it a chance, I hope you enjoy the game. 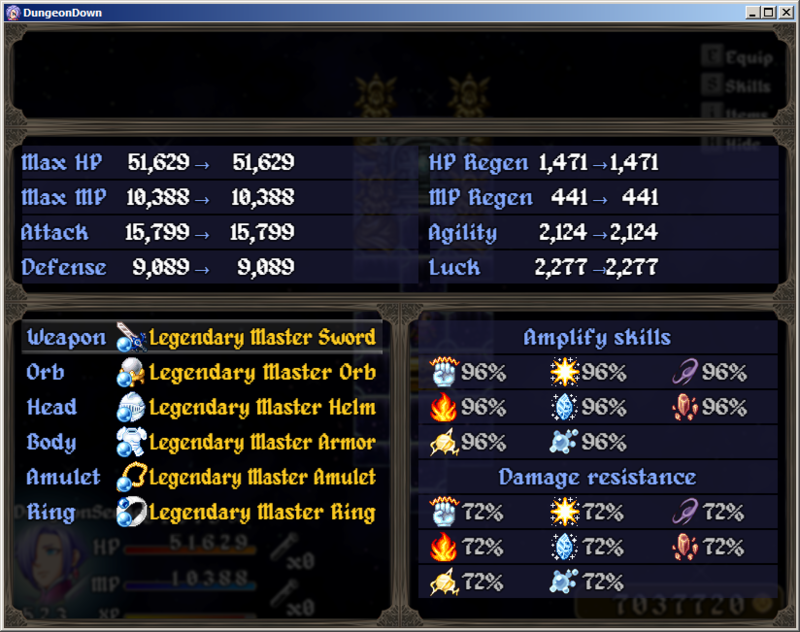 Great game, currently level 92 on 84th floor. Im interested too see how far this game goes. Will continually check for updates. Hello @mathalas, thanks for playing the game. The game was developed in one month for the IGMC contest, despite having more than 80 floors, the game is relatively short. I hope you had fun. I have a plan to make a bigger version of this game with more skills and different classes, but for now it's just a draft. It seems awesome, will definitely try it tonight! Thank you @Solarfun Games Studio. I definitely will try your game too!